In the Orinoco Llanos, archaeological studies indicate a continuous late Holocene human occupation, including the development of ranked societies, from about 1,500 year bp (ad 500) However, until now palaeoecological studies dealing with the impact of anthropogenic activities in the region have been scarce. 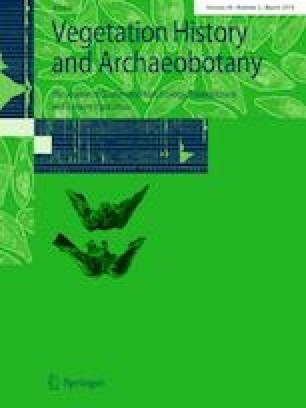 Here we present a palynological analysis carried out in the El Cedral archaeological region, Western Venezuelan Llanos. The 145 cm sedimentary record obtained comprises the last ca. 4,200 cal bp (2245 cal bc). Between 4,200–3,800 cal bp (2250–1850 cal bc), wet savannas interspersed with gallery forests dominated in the study area. A wet climate, similar to the present, is suggested by pollen of aquatics and by non-pollen palynomorphs (NPP). Frequent/intense local fires were inferred from charcoal concentrations. Between 3,800–2,100 cal bp (1850–150 cal bc), rapid alternation between forest and savanna-dominated phases occurred. The low diversity of NPP and the low values of pollen from aquatics suggest drier climate conditions than the present. Low charcoal concentrations point to low fire frequencies. Two events of forest expansion at 3,400–3,200 and 2,800–2,100 cal bp were recorded, alternating with savanna-dominated phases (at 3,800–3,600 and 3,200–3,000 cal bp). From 2,100 cal bp (150 cal bc) to the present the expansion of savannas is recorded. Zea mays occurred at 1,880 cal bp (ca. ad 70), accompanied by the increase in charcoal concentration, supporting the hypothesis of intensification of human activities and anthropogenic forest clearance. Different climatic phases recorded in El Cedral match with those described from the Cariaco Basin, indicating that El Niño Southern Oscillation variability was the main climatic forcing. However, the intensification of anthropogenic activities limited the forest expansion expected during the last two millennia, yielding evidence of landscape domestication in this region. Communicated by W. D. Gosling. The authors would like to thank the National Fund for Science and Technology of Venezuela (FONACIT) for the financial support given through Grant 2011000404 to the project “Impacto del cambio climático y de la ocupación humana en los mosaicos sabana-bosque de la Cuenca del Orinoco: un enfoque transdisciplinario”. We truly appreciate the willingness of the family Briceño in Barinas to allow sampling in their property. Finally, we would like to show our gratitude to Abelardo Márquez for his friendship and guidance in the field.